But the office building suffered a real disaster in 2001, when an electrical fire rendered it uninhabitable. It stood vacant until two years ago, when it was extensively renovated into a mixed-use condominium and retail project. As part of this renovation, the building was stripped to its steel skeleton and given a new “skin” that included frames on all four sides for 10 story-high, 5,000 sq. ft. billboards. Technically called “supergraphic” signs, these brightly-lit advertisements for movies, TV shows and products like premium whisky dominate the visual landscape of that intersection and surrounding area. Someone with only a passing knowledge of billboard regulation in L.A. might reasonably ask how these signs were legally permitted, given that the city adopted a ban on new billboards in 2002. The short answer is that the city made an exception for signs erected in selected areas designated as signage supplemental use districts, an exception that has proved to be giant loophole allowing our public spaces to be invaded by ever more bold and intrusive forms of commercial advertising. The Hollywood Signage Supplemental Use District, which encompasses a large swath of that community, was adopted in 2004. One of the stated purposes of the district was to “reflect a modern, vibrant image of Hollywood as the global center of the entertainment industry;” another was to “limit visual clutter by regulating the number, size and location of signs.” Perhaps there is an inherent conflict in those intentions, but if a vibrant image of Hollywood is projected by huge, flashy advertisements incorporated into such buildings as the Sunset and Vine tower, and the tens of thousands of square feet of advertising signs either installed or proposed as part of new developments, it’s clear which intention has carried the day. 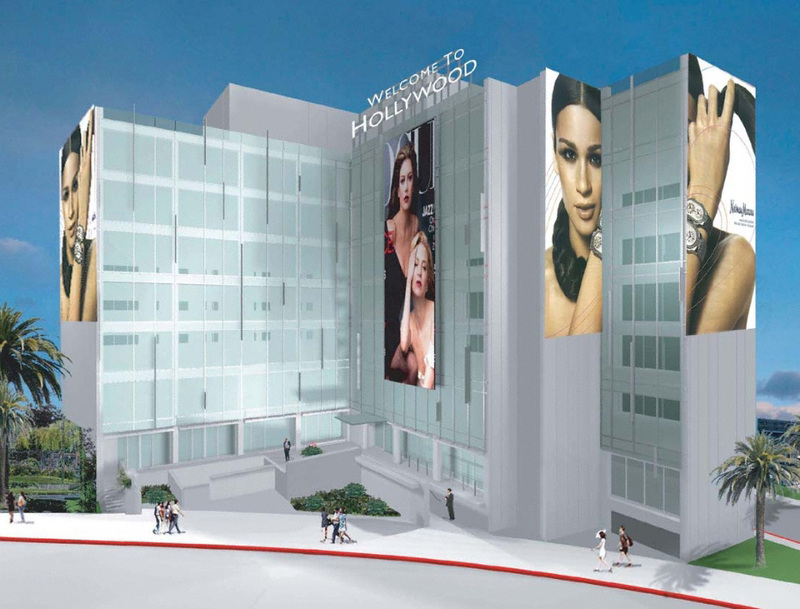 A few blocks away, an entire block at the iconic corner of Hollywood and Vine is being turned into a hotel, condominium and retail project that will have 23,000 square feet of supergraphic signs and rooftop billboards. On Hollywood Blvd. near Graumann’s Chinese theater the restoration of an historic building is to include a 5,000 sq. ft. roof sign that is taller than the building itself. A block north, on Highland Ave., an office building undergoing renovation includes three supergraphic signs totaling more than 6,000 sq. 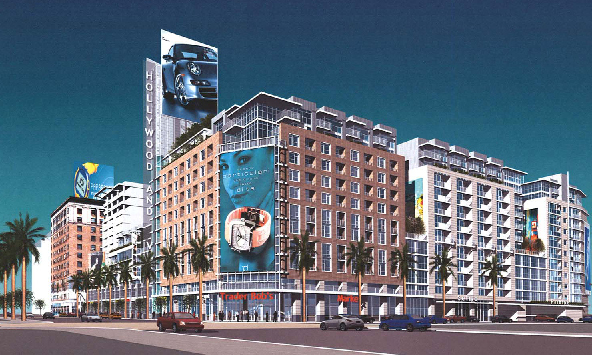 ft., and the recently approved mixed-use project at old Spaghetti Factory site on Sunset Blvd. will have two supergraphic signs of more than 3,000 sq. ft. That’s a total of 57,000 square feet of off-site advertising signs in just five projects, or the equivalent of 84 full-size billboards. The signage district provided the legal path for this onslaught, but the real enablers have been two city bodies, the Community Redevelopment Agency (CRA) and the Central Area Planning Commission (CAPC). 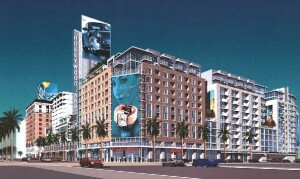 The CRA has encouraged developers who claim they need the revenue from advertisers to make their projects financially feasible, even though that argument becomes a little curious when one considers that CIM Group, the developer of four of the above five projects, has worked extensively in Santa Monica, a city that has an absolute ban on billboards and other forms of outdoor advertising. The Hollywood Signage Supplemental Use District includes specific regulations concerning the number, size, and location of signs, but the CAPC has regularly sided with developers who propose signs that go far beyond these limits. 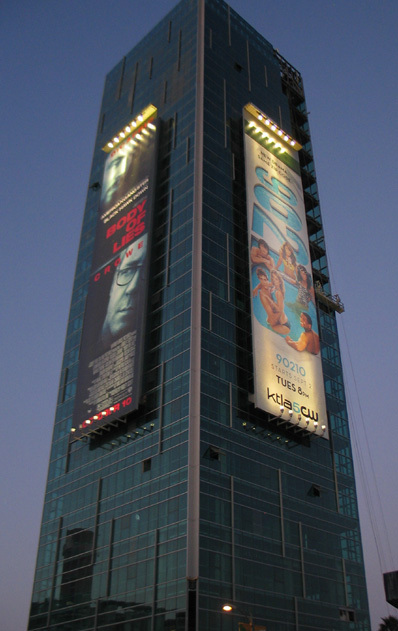 For example, the sign district regulations would have limited the supergraphic signs on the Sunset and Vine tower to a total of two, and required that they not be visible at the same time from a single location. The CAPC approved a doubling of the number of signs on the grounds that no two signs would be visible at the same time, which is completely false, as is clear from the preceding photograph. The CAPC, whose president is Young Kim, a Koreatown attorney appointed by former Mayor James Hahn and who was fined for making an illegal contribution to Hahn’s campaign, has overruled city planners who have said that sign regulation exceptions sought by developers do not meet the criteria set forth in the city charter for granting such exceptions. For example, a city planner found that the 5,000 square foot roof sign proposed for a building to undergo renovation at 6904 Hollywood Blvd. would violate multiple provisions of the Hollywood sign district, but that decision was unanimously overruled by the CPAC. Although the city charter doesn’t include economic hardship or feasibility as grounds for granting variances or exceptions to city zoning and planning regulations, the CPAC has repeatedly cited a project’s need for revenue from off-site advertising as a reason why limits on size and number of signs should be greatly exceeded. The Hollywood Signage Supplemental Use District is one of only two adopted in the city, but the fact that eleven more are pending in various stages of the approval process makes the huge proliferation of advertising signage in Hollywood a cautionary tale for other areas of the city. Do people want to create a replica of Times Square in Koreatown, at the Mid-City Crossings area, on the north side of the 110 freeway downtown? These are just three of the proposed sign districts, but each time one is approved there will certainly be more pressure to approve the next. Thank for documenting the latest assault by the advertising industry and city government on our public spaces, which is euphemistically termed “architectural signage.” Such pre-approved, built-in signs seek to legitimize the crass defacement of the built environment. The political class and its insider commission and agency appointees are obviously bereft of aesthetic sensibility or even respect for their own constituencies. But where are the protests from the professional architectural, historic preservation, and planning societies? I’m an artist who lives in Hollywood. I’m of the opinion that visual artists, long the unintended victims of this ongoing billboard debate, have stood silent and have been strangely absent from this important dialog for far too long. 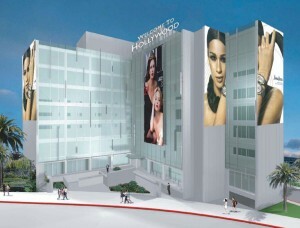 I’ve proposed an ARTWALL project to the CRA, for the façades of the Arclight Cinemas parking structure. This is a CRA-owned building. It is located in the Hollywood sign district, at 1400 N. Ivar. The building fills the block between Vine St. and N. Ivar, its east-west borders; with De Longpre on its south and its north side adjacent and attached to the old Cinerama property, now known as the Arclight Cinemas development. ARTWALL is proposed as an improvement for the building, whose utilitarian purpose results in a hugely oppressive presence that is essentially a flat-face block of concrete 425 ft. wide (east-west), 80 ft. high, and 250 ft. deep (south-north). Visually, it is hardly more than a slab. It’s an example of the architecture that results when automobiles are placed at the top of priority lists; as planning requires developers to include space to store cars instead of requiring developers to contribute to the improvement of public transit systems that might lessen automobile traffic and congestion. To soften the building, I’ve proposed a set of picture frames for display of modern art prints, digital photographs, and enlarged film-still photographs. These frames off-set the flat rectilinear shape of the structure, echoing and enhancing the parsimoniously, if not halfheartedly, designed pipe-frame device that presently supports a steel mesh screen intended to hide the ugly open slots of the seven-level auto-lot. At night, the steel mesh is ineffective. Through the darkness, the neighborhood is given the bleak view of fluorescent-tube light fixtures and flashing headlights as cars idle in procession down the parking structure’s ramps. The building sits on the northern edge of what will be the Academy of Motion Pictures Arts and Science’s new “Academy Museum of Motion Pictures”. The museum coordinator, Heather Cochran, agrees it’s a problem as it stands. Part of the resistance I’m getting to my proposal results from CRA’s hesitancy; a direct outgrowth of the billboard debate which, if I’m not mistaken, has to do with the justified objection to the crass commercialism, built on outrageous and prurient spectacle, that has become the hallmark of advertising in the early 21st century. Somehow, the debate over billboard blight has to be prevented from being used by bureaucrats as a convenient way to reject genuine artistic expression. The two can’t be lumped together and it’s the responsibility of artists to make themselves heard. Until then, murals and other public art projects will continue to meet resistance from appointed officials afraid to distinguish between the two. I feel the solution to the problem of billboard blight is caused by artists failing to be heard on the issue. In fact, there are new digital technologies that represent a potential solution to the conflict between neighborhoods tired of being assaulted by aggressive messaging and the corporations who tie their success to the ability to most effectively assault the public’s senses. If all that makes art worthy could be applied, instead; if through an aesthetic melding of composition, form, light, and color a new way could be devised to tone down and/or re-intermediate the commercial messaging, then all of us would be the better, one day hopefully unified. For divided we fall and together we stand.